A girl winning $100,000 of tuition in a halftime contest is always a reason to cheer. 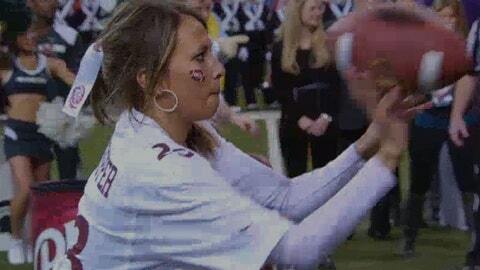 Even when she’s throwing footballs with two-handed, chest passes. Molly Brown of North Canton, Ohio, stole the show at halftime of Saturday’s Big Ten Championship game on FOX, winning the passing accuracy challenge with a brilliant strategy — looking like she was playing Pop-a-Shot at Dave and Buster’s. She beat a guy, Alex from Minneapolis, who was throwing the football more like a Tebow than a Brady. She smoked him, 18-10. At least Ohio could claim one winner after the night was over. The second-ranked Ohio State Buckeyes lost to Michigan State, 34-24, blowing their perfect season and shot at the BCS title game.